Anti-nuclear demonstrations, Stuttgart 21 and the Occupy movement: Germany takes to the streets. Many citizens are dissatisfied. Electing delegates isn’t sufficient anymore, they also want a direct say when it comes to particular themes. The call for more direct democracy is increasing. In the Netherlands, Volkswagen is setting on a very unusual advertising tactic. The German automobile manufacturer wants to design a Facebook style „Fanwagen“ that will cruise the streets of the Kingdom of the Netherlands and is relying on the assistance of users of the social media platform Facebook. Based on the Crowdsourcing principle users can decide which of the two cult models will come out on top by clicking on the Like button. 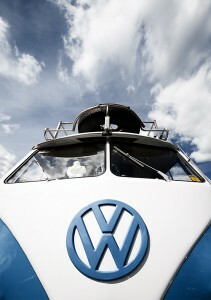 The choices are either the timeless VW Beetle or the hippie Volkswagen Bus Transporter 1. Following the great success of the Crowdsourcing project “Life in a Day – The story of a single day on Earth” produced by Ridley Scott and Oscar winner Kevin Macdonald last year, Great Britain is now due to become the location of a large-scale film project. The popular British newspaper “The Guardian” has already shown in the past, that it pays to be open for online innovation and social media activities in the network (see also: When Newspaper Enthusiasts Become Investigative Journalists ). Now, the newspaper surprises with a new social media experiment by opening the doors of their news-desk to the crowd.